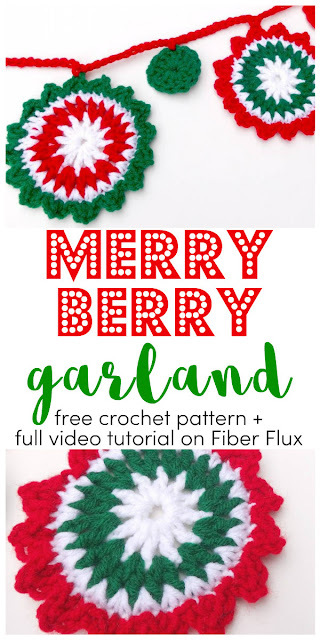 Fiber Flux: Free Crochet Pattern...Merry Berry Garland! 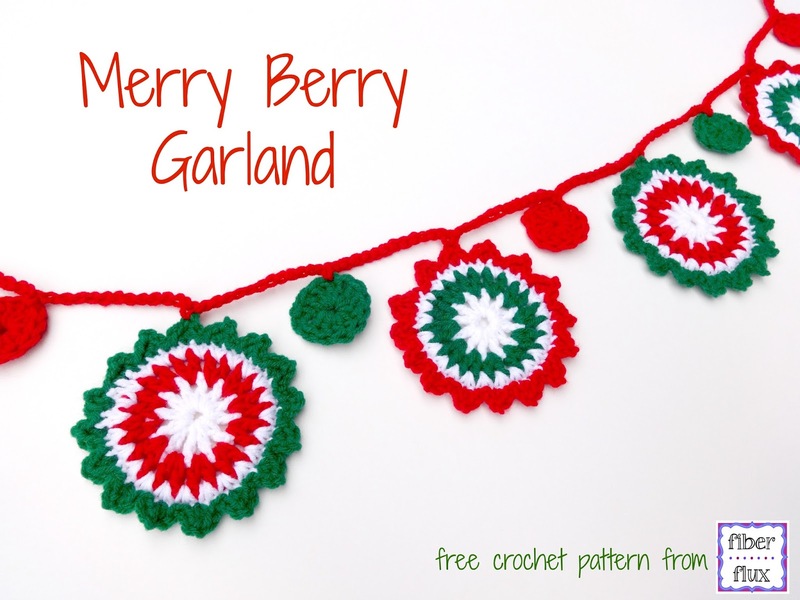 Free Crochet Pattern...Merry Berry Garland! The Merry Berry Garland is full of holiday cheer! This easy and pretty pattern makes a lovely addition to the home. I made mine for a window, but you can make an extra long one for a tree, mantel, or even a mirror. 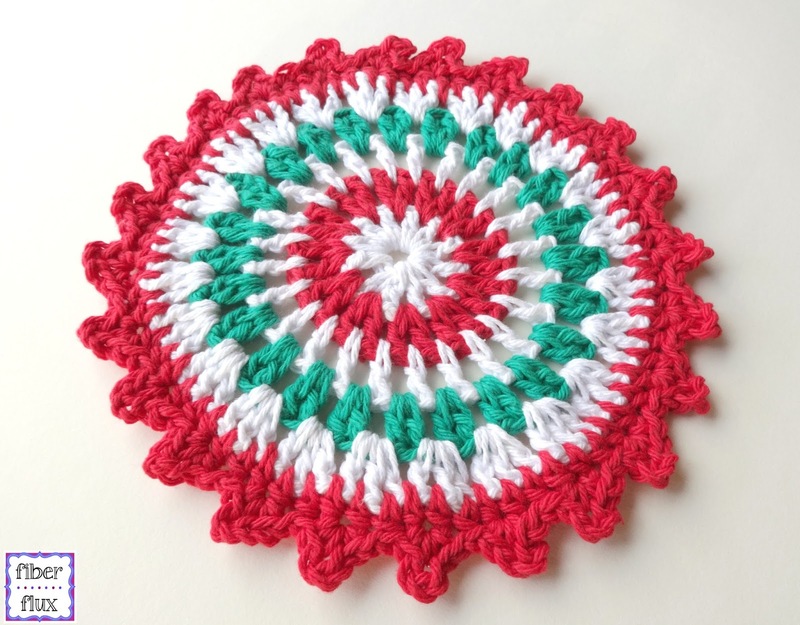 Get the Merry Berry Coasters pattern here! Get the Merry Berry Dishcloth pattern here! 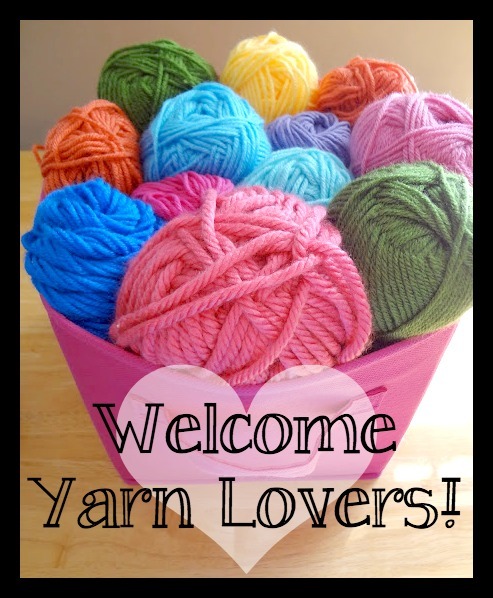 Worsted weight yarn in colors of your choice (yarn shown is Red Heart Super Saver in "Cherry Red" "Paddy Green" and "White"
Ch 4 and join into a ring with a slip stitch (Work this in white). Round 1 (white yarn): ch 4 (counts as a dc), then (dc into center of ring, chain 1) 11 times. Join to close with a slip stitch. Round 2 (red or green yarn): Chain 4 and work a dc in the same space. Chain 1, then work two double crochet in the next (chain 1) space. Keep doing this all the way around, working 2 dc, ch 1 in each space. Join to close round with a slip stitch. Round 3 (white yarn): Chain 2, then work a hdc in the same space. In the next space (in between each dc post), work 2 hdc. Repeat around circle, then join to close with a slip stitch. 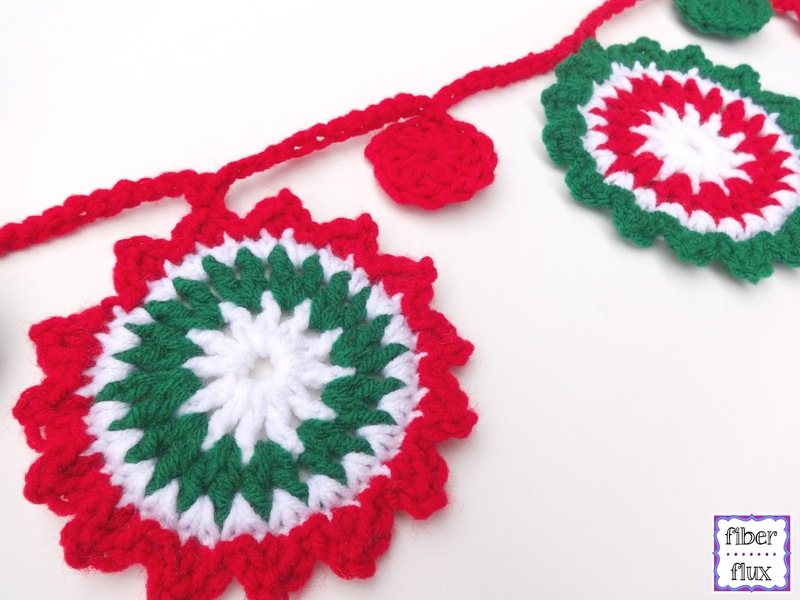 Round 4 (red or green yarn): Work a sl st into the first st, a sl st into the next st, then in the next st (sc, ch 2, sc). Repeat this sequence all the way around the circle. Fasten off. Ch 4 and join into a ring with a slip stitch (Work this in red or green).Round 1: ch 4 (counts as a dc), then dc into center of ring 11 times. Join to close with a slip stitch. Weave in all ends. Determine how much spacing you'd like in between the circles. I found it helpful to lay out all of the circles the way I wanted before beginning. The garland shown has 12 chains in between each. To begin, chain 12, slide a circle onto your hook and work a sc to add it on. Ch 12, then add another circle, ch 12, add another circle and so on. Finish up by doing 12 more chains.